Al Sadu is the term for traditional Bedouin weaving, done on a ground loom. 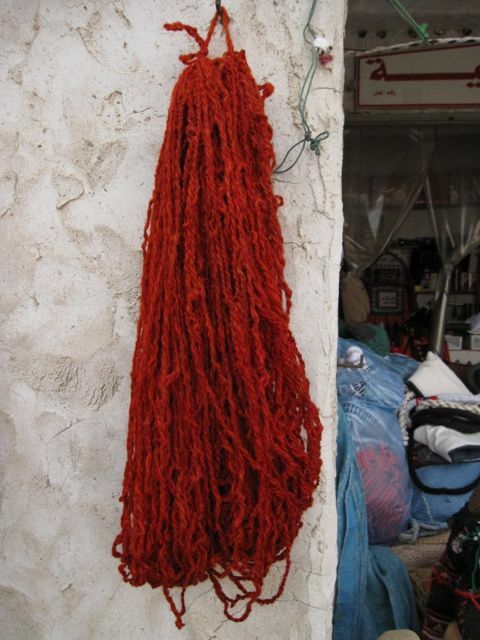 This has been the method for making everything from homes (Bait al sha'r, 'houses of hair', i.e. tents) to camel harnesses and carrying bags for the nomadic Bedouin throughout their history. It is the role and pride of Bedouin women, to spin and weave the material world that surrounds the family. Handwoven tent wall, qati', made by Umm Hamad who is holding it up. The weaving is made in five bands, joined horizontally, with a dense pattern of weft twining at the end. I was fortunate to observe and document the work of Umm Hamad of Qatar, who exhibits her wares in Souq Waqif, during 2010-2012. She is an active weaver who spins her own yarn, and the images on this page are all examples of her work. Much of her weaving is with handpun, hand-dyed wool, but she also incorporates commercial yarns in wool and cotton, with extra twist added on the spindle. Freshly dyed handspun yarn, which will be more tightly plied once it's dry. Umm Hamad has a small, metal frame loom at the souq, where she can weave smaller pieces. Large items are woven at home. Women often set up their looms on the roof, or in a long hallway. All that is required are stakes to hold the bars at each end, and props for the stationary raised heddle. Small frame loom set up and warped. Detail of weft twining on tent wall. Detail of most intricate band of tent wall. It is hard to express the intricacy and expertise of this large tent wall piece. It is the culmination of all technical and design skills. Every traditional pattern is represented: the blue and red drus al khair, horse's teeth, the pebbly al'ouerjan in three colors. Both of these are partially programmed into the warp, and partially picked up by hand. The black and white improvised sh'jarah, or 'tree' section in the middle is completely picked up by hand. It is supplementary weft, with two yarns in each warp, thus the floats on the back. 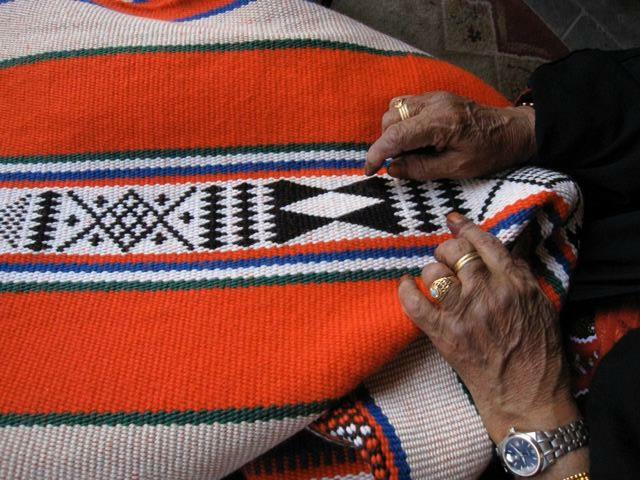 The design of each row is chosen, one yarn at a time, according to the weaver's ideas. Umm Hamad told me some of these designs are learned, others are spontaneously invented, and this improvisational quality is easy to see in the flow of unpredictable designs. Umm Hamad explains the sh'jarah designs. The motif nearest her hand is the shape of a traditional incense burner. I eventually bought this camel bag, which was woven by Umm Hamad about 15 years ago. It is completely commercial yarn, no handspun, but the tradeoff is fineness of quality. The intricacy, color choices, and skilled finishing work drew me to this weaving. All of the main weaving and finishing techniques are represented, which is unusual to find in weavings made these days. Buttonhole stitching (dhras) around the pocket edges, with fabric reinforcements, and decorative joining stitch (habkah, dhurais) along the side edge. Note also the sparkly silver yarn used in a woven stripe - it would not be from Doha if it didn't have sparkle! The salmon pink and kelly green ouerjan section strikes me the most. It's a very interesting color selection, and an unusual two-color ouerjan that I haven't seen in any other piece. Umm Hamad calls it ouerjan med-khar, as opposed to ouerjan a-bakr. To be clear, when I say ouerjan, I'm referring to a technique like the central strip of the band below, in black white & red. That is the typical arrangement of colors, and the technique, with varying patterns of color, is commonly incorporated into Bedouin weavings. Along with sh'jarah, it creates the signature look of Bedu textiles. One more piece, fully handspun and dyed by Umm Hamad. I saw much of the spinning and plying, and I believe it makes use of the red yarn shown above on this page. For more on Bedouin weaving, see Joy Totah Hilden's excellent book Bedouin Weaving of Saudi Arabia and its Neighbours, 2010. I am indebted to her research for the weaving terminology and understanding of the techniques.